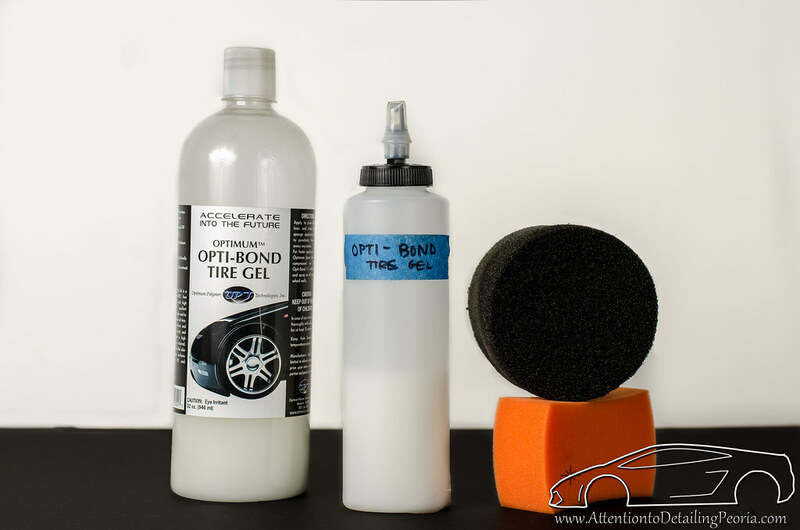 Optimum Opti-Bond Tire Gel is one of my favorite tire dressings to date. Over the years I have had several of customers ask me not to apply tire dressing because they leave a greasy, unnatural appearance and sling product on the clean paint. In each of these cases, I have convinced the owner to allow me to dress their tires by assuring them that the product I will use is going to provide a beautiful appearance, a dry-to-the-touch finish, and will not sling onto their paint. Opti-Bond has never failed to deliver these results and my skeptical customers were converted to tire shine believers. Below is the product description for the Opti-Bond. The Optimum Opti-Bond Tire Gel is a thick tire dressing that leaves an unbelievably rich and glossy shine on your tires. Just apply one coating of this gel and your tires will instantly have that extra deep “wet” look. This water based formula uses no VOC’s or harmful solvents so it is totally safe your tires and the environment. Since this is a water based formula it will actually be absorbed in to the rubber. This has two primary benefits, one is that it nourishes the rubber keeping it healthy and secondly it will last extra long. Silicone based dressings just sit on the surface, which makes them prone to “sling” on to the paint and they also can brown tires. The Opti-Bond Tire Gel is one of the premium tire gels ever made and it will be sure to please every detailer who likes that extra glossy shine on your tires. Before applying Opti-Bond, the tires should be thoroughly cleaned with the Tuf Shine Tire Cleaner and Tire Brush, and then blown dry with the Metro SideKick Blower. 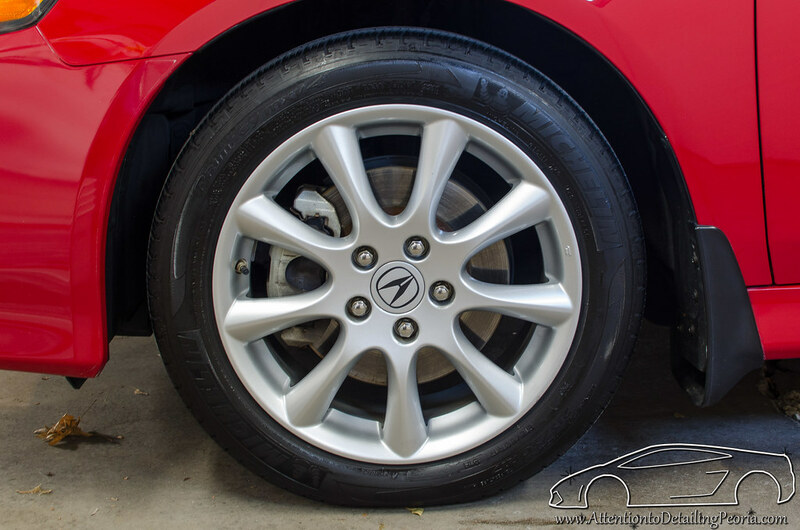 Remember, it is important to remove any dirt or old tire dressing from the surface of the tire so that the new dressing can soak into the rubber. Since Opti-Bond comes in a larger bottle, I transferred some into one of my Meguiar’s self cleaning dispenser bottles for easier distribution. I prefer to apply my tire shine with a foam applicator like the Lake Country Tire Dressing Applicator or Tuf Shine Applicator Sponge. I applied a line of product across the face of the applicator and then worked the dressing into the tire. Opti-Bond is a thicker consistency which makes it easy to apply without dripping onto the clean wheels. The following photo shows the difference between the left side of the tire immediately after applying Opti-Bond and the right which has not been dressed. I continued to spread a thin, even layer of product until the entire tire was covered. After covering all four tires, it is best to allow the product to absorb into the rubber for 15-30 minutes. Afterwards, additional coats may be applied to further enhance the appearance of the tire. Since Opti-Bond’s water based formula allows the product to penetrate and nourish the rubber, it is possible that several coats may be needed if the tire is particularly dry as the tire may continue to soak up the product. In the photo below, you may notice some areas that appear ‘wetter’ than others. This product should soak into the tire leaving a level finish after several minutes. If too much product is used during application, there may be excess remaining on the surface of the tire. If this is the case, simply grab a black all-purpose microfiber towel and gently wipe away any excess product. 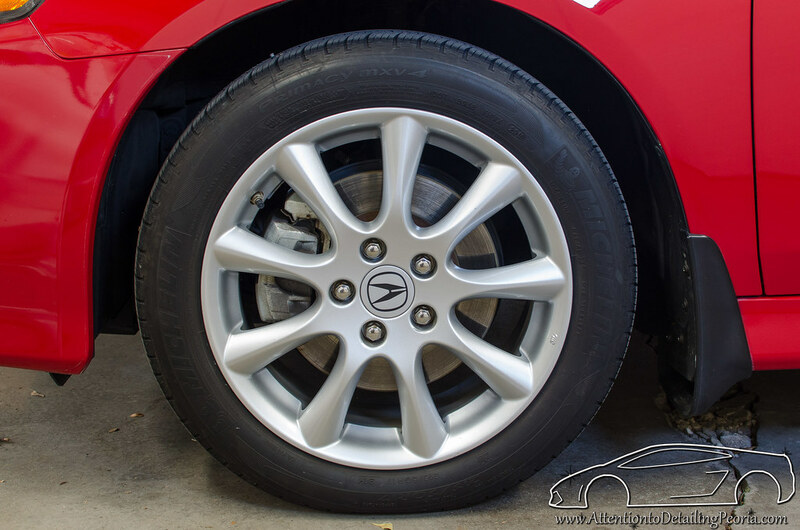 As always, it is best to allow the tire dressing to dry for a short period of time before driving. 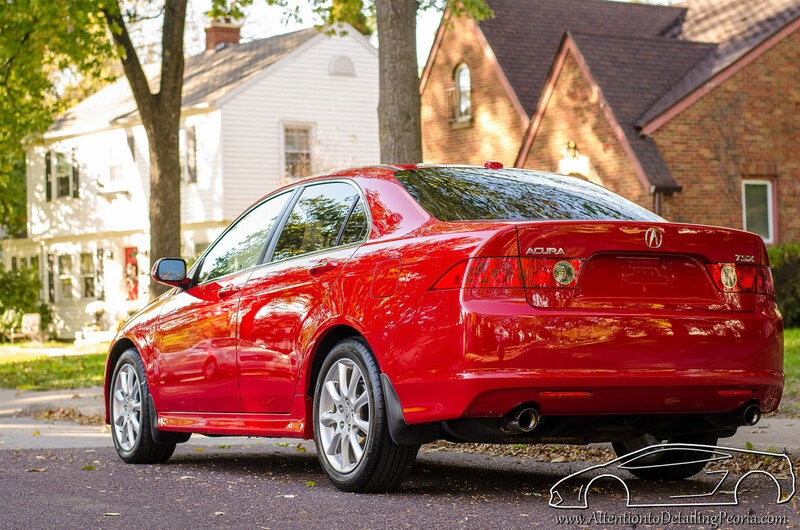 After two light coats of product, the tires were left with a very natural looking sheen. They are nice and dark, and really help complete that “just detailed” look. I have been using this product for a while and am always pleased with the results. I have found Opti-Bond to be fairly durable. The dark appearance tends to begin fading after a week or so (poor weather may decrease durability), and I typically scrub my tires and apply a new layer at least twice a month. While Opti-Bond is called a “Tire Gel” it is also worth noting that it is very effective at restoring and protecting vinyl, plastic, and rubber trim. I use it on my plastic engine covers, and other exterior trim, and it looks great! All in all, this is a great product that has many uses and will be something that always has a spot on my shelf. Try some out for yourself, I’m sure you’ll enjoy it! Purchase the products used in this article individually or in one convenient package here! I’ve had OB in my arsenal for years. Good stuff and good review Zack. Are the lake country tire applicators single use/disposable? If not, how do you suggest cleaning them after using with OB? The lake country applicators can be used many, many times. Opti-Bond is easy to clean up since it is a water based product. You can simply spray some all purpose cleaner like Meguiar’s D101 onto the applicator, agitate if needed, and then rinse the applicator thoroughly. Hope that helps! Thanks Zach, I’ll give it a try! Do you dilute the product or use it full strength? I use it neat, however I have heard that some people dilute it 1:1. I prefer the thicker consistency of the product as it is. You can always dilute a small amount and try it out to see if you like it. Saludos Zach . Uso mucho este producto y es excelente . Pero queria comenter que en una botella con rociador hice una mezcla de 4:1 y lo utiliso para las orillas de los neumáticos para que penetre bien en esa area . Primero aplico de esa manera y luego que seque utiliso el OB puro para aplicar a todo el neumático y me de excelente resultado . Gracias por el post .